SoundArt Radio was also linked with the inspirational community Radio La Colifata airing from the grounds of a psychiatric hospital in Buenos Aires – which has been filmed in action plus being supported by international-renowned ‘world music’ artist, Manu Chao. 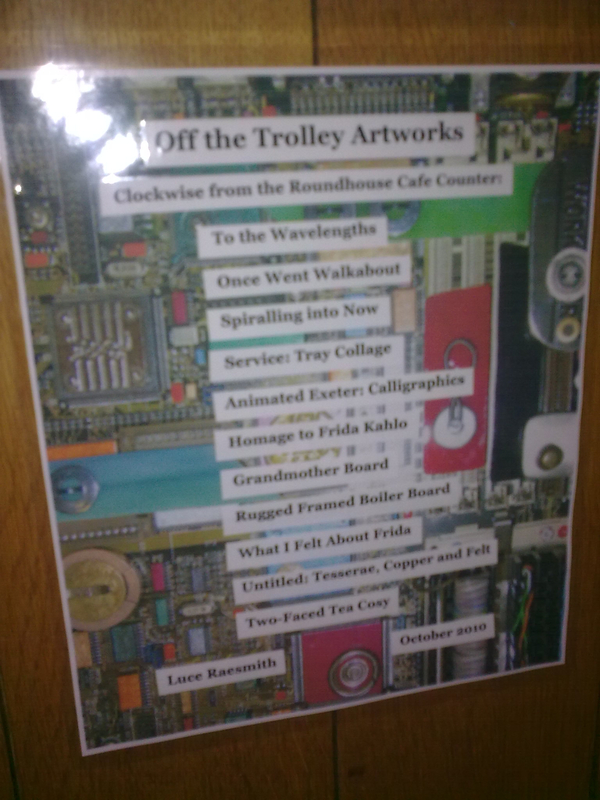 Off the Trolley Artworks: The pieces in this exhibition represent artwork that I have produced over the last fifteen years. My ‘practice’ is sporadic and functions in the main to produce objects that add colour to my living spaces. Some pieces (‘Service’, ‘Animated Exeter’, ‘Homage to FK’ and two felted ones) have been created as coursework projects whilst attending access, adult education or return-to-work art and craft courses. My life experience has been ‘coloured’ by mental health challenges. The earliest created piece here, ‘Spiralling into Now’ directly expresses a continued journeying between grey, low periods and brighter, more ‘up’ times. My employment (and education) history has been a chequered affair due to 40+ years of living with depression and anxiety. With resulting low income, my artworks have of necessity been assembled from free – or minimal cost – found, broken or recycled objects. This creativity is both sustaining and sustainable! Many transgendered persons, including myself, have been diagnosed with bi-polar disorder prior to gender transitioning; the mental health diagnosis serves to validate the individuals’ gender dysphoria that is currently classified by consultant psychiatrists working within gender identity clinics. It has frequently been a compulsion of mine to feature an interplay of grid and circular ‘lines’ in my work. With hindsight I have recognized that I was expressing my dual-gendered nature – as an androgyne who is ‘electively hermaphroditic’ – in this interplay of archetypal male rectangles and squares alongside female circles and spirals. The choice of media represents a similar juxtaposition by the ‘yin and yang’ of the materials: flexible textiles, leather and paper against rigid plastics, glass and metals, etc. Off the Trolley productions: artworks, creative writing and performance – including recording and broadcasting for Soundart Radio’s 10/10/10 ‘Unsane Rhapsody’ – are conscious actions responding to life’s tragi-comic paradox(es); are positive efforts to stay (un)sane in an increasingly insane world.